Keep hot and cold cup lids clean and organized with this San Jamar L3502 wall mount double lid dispenser. 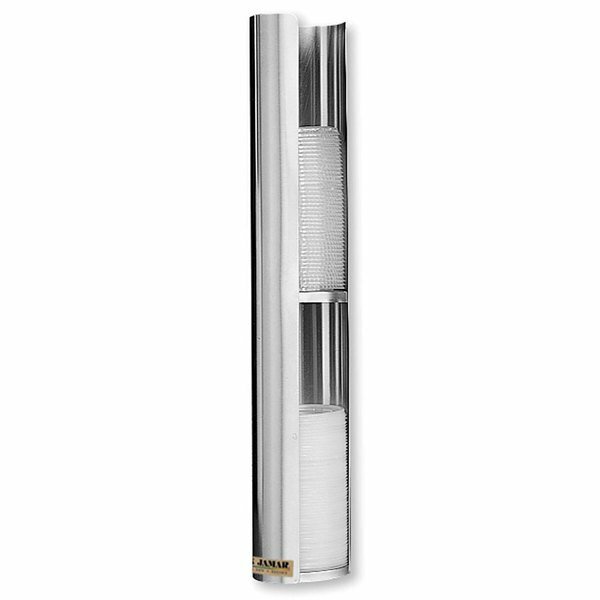 The San Jamar L3502 lid dispenser has two separate sections, which allows you to store different sized lids, up to 5" in diameter, in the same dispenser. Its simple front-loading design makes it easy to fill, and its versatile brackets allow it to be used with a compatible dispenser stand if needed (sold separately). This unit includes just a few parts to make installation a breeze. Using this dispenser will help keep your business neat and organized. Not only does it help keep lids from scattering all over your drink station, but it also frees up your counter space! You can mount it on a wall and thus keep your stations organized and clutter free for a professional look guests will appreciate. We love the 2 different size lid holder. The lids doesn’t fall off. It’s stays in place. Daily usage and space saver. Easy to wipe down. This is a great product ! All SS construction looks really neat and clean on our soda counter top. This product reduced lots of clutter sitting on the counter top. Highly recommended ! We only have 2 sizes of lids for our fountain drinks so this we perfect for us to place out by our dispenser for the customers to use. Very sleek and modern. Small enough not to clutter up everything, but big enough to hold all my lids. Quick and easy installation! Easy to keep clean too! This lid dispenser is wonderful! It holds our lids very nice and is easy to pull lids out of which makes it nice when you are in a hurry. It looks great on the wall and we really like the two different dispensers so we can put two different kinds of lids in it!